With technology evolving so quickly, it’s difficult to predict what next big gadget will fully integrate itself into our everyday lives. Whilst it’s almost impossible to imagine a world without your iPhone or game console, household items are becoming more technologically aware – televisions can be hooked up to your home network, fridges are beginning to run operating systems, even toilets are adapting to ensure the user is as comfortable as possible. Here is a list of gadgets we feel will bless your homes in the future, some of them will genuinely baffle you. During The Next Web Conference in Amsterdam, our Editor-in-Chief Zee took residence in a quirky but futuristic apartment in the city. Whilst there, he remarked on a “really cool” toilet that was very similar to the model below. The Kohler Numi has the tagline “Take Comfort. Take Control” – an impressive call to action if there ever was one. The toilet is Kohler’s most advanced toilet, combining unique design, the latest technology and advanced engineering to deliver the “finest in personal comfort and cleansing”. I bet you are wondering what this toilet does to make it so special. The Numi boasts unrivalled water efficiency, a motion activated lid and seat, advanced bidet functionality, an integrated hair dryer, deodoriser (apparently air is pulled through a powerful deodorising charcoal filter), a heated seat, feet warming, illuminated panels (just in case you forget where it is?) and music, which can be set to play pre-programmed audio, FM radio or to connect your MP3 player through the audio input jack in the remote docking station. Pretty novel, don’t you think? The only thing it doesn’t do is cook your meals and iron your clean clothes. 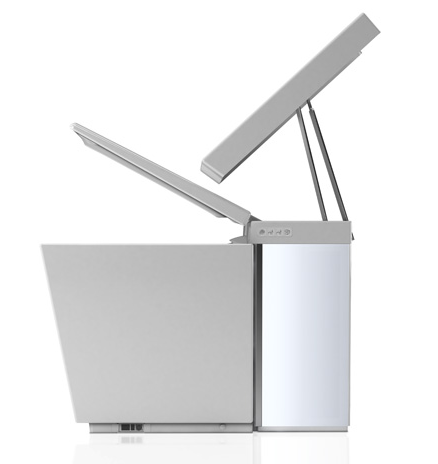 The Kohler Numi is a snip at $6400, we imagine the power it consumes makes using it a whole lot more costly. Smart fridges are already making their way into the market, Samsung only recently announcing a new range of coolers that are WiFi-enabled, feature an 8-inch LCD screen and provide access to Google and Twitter. A collaboration between online supermarket Ocado and the University of Central Lancashire is set to push the limits of existing refrigerator technology, offering the ability to clean itself, cut down on wasted food, automatically order fresh supplies and help you cook meals from the ingredients inside your fridge. The fridge would include ‘nano-articulated technology’ shelf surfaces which have millions of independently controlled micro-tiles that will move products which soon need to be eaten to the front of the fridge. Ultrasound technology will allow the fridge to ‘swipe and capture’ the food on a plate before and after eating, so it can assess what food is being wasted. 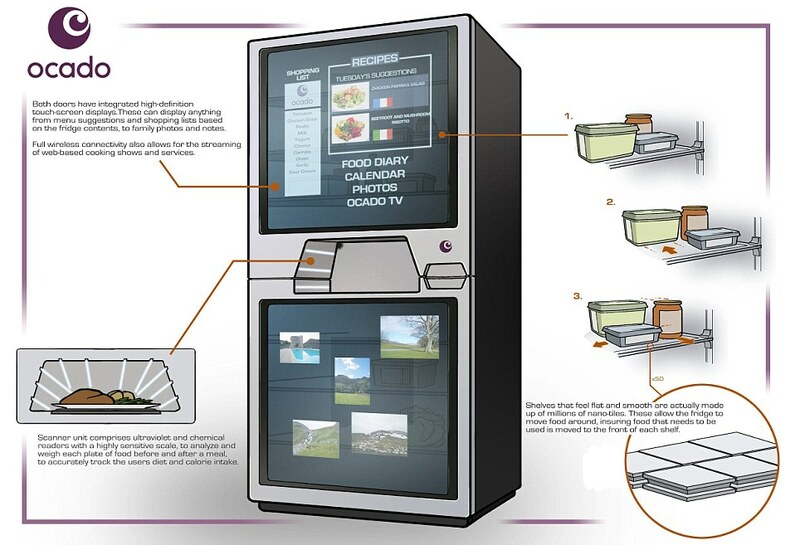 Whilst this appliance is a long way from being realised, it is the future of refrigeration technology. Will we get lazier in the future? This gadget will ensure we most probably will. Holographic televisions aren’t too dissimilar from their 3D counterparts, holographic technology is already being used by companies like Cisco to enable companies to hold face-to-face business meetings or report news live on TV from the other side of the world. Modern day 3D TVs come with glasses, or require the viewer to sit perfectly still in front of their set, keeping within a certain viewing angle. Holographic pictures could be beamed from different angles, under tabletop surfaces to generate realistic 3D effects, without glasses (think Princess Leia’s distress signal in Star Wars). Before holographic devices hit living rooms, holograms will need to be bigger and faster. Currently, researchers are working to upgrade 50 hertz lasers to ones that operate at faster gigahertz speeds, whilst increasing the size of the screen and miniaturizing the technology to do so. Researchers give it 7-10 years, we think it will be sooner. Some say a bed is just for sleeping – Hi-Can takes that statement and rips it up in front of your face. Looking like a four-poster bed that time travelled 25 years into the future, the Hi-Can comes with a remote control that allows you to lower each of its three blinds, providing maximum darkness at any time in the day. One of the screens doubles as a screen for its built-in HD projector, which is accompanied by a top of the range audio system that features speakers by B&W and JVC and a Rotel amp. If that wasn’t enough, the bed also comes with an Xbox, catering for all your gaming needs. Remember that remote? It also allows you to adjust the level of the lighting and angle of the mattress. Impressive, no? 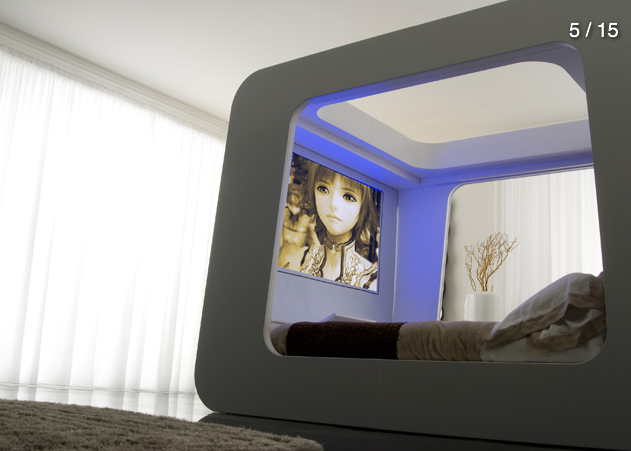 The Hi-Can is already shipping but we can imagine beds like this becoming more widespread in a couple of years. The Long Form Library functions as a haven for your books but also doubles as a comfortable reading area complete with lighting and space for additional electronic items. Designed by Thomas Mills, the circular library stands 246cm tall and is crafted from hand-cut plywood. When someone sits in the structure, the cradle rocks back and forth, whilst holding its weight in books. The reading lamps also double as a clock, changing brightness as the day goes on. The bottom of the cradle can be filled with AV equipment and a range of different electronics, boosting the functionality of the library depending on what you decide to outfit it with. Costing a cool £6000, it can’t be shipped. Instead Mills will travel to your home and craft one for you. Pretty cool if you ask us.